Daisy recently decided to get a tattoo. And not just any tattoo, but a tattoo of a magpie, drawn by her, and turned into a tattoo by Daisy’s sister’s boyfriend, Sean, who has done a tattoo featured here before. 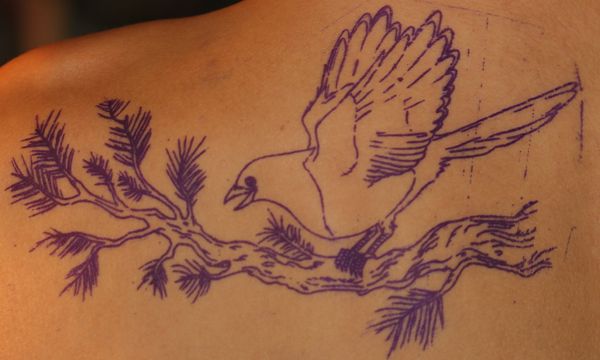 So, once again I photographed the tattoo process so all you loyal 10,000 Birds readers can see how bird tattoo comes to be. This post will only get as far as the tattoo has gotten so far, which means that it will end after the outlining of the tattoo is complete, which is as much time under the needle as Daisy wanted to endure in one go. But why a magpie? 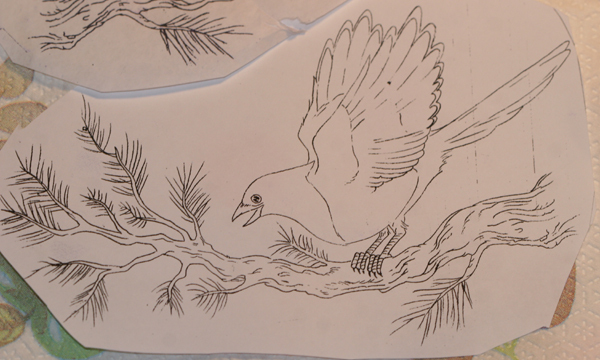 Well, the magpie is only the first half of Daisy’s tattoo: eventually there will also be a tiger involved. The concept comes from Korean folklore. In Korean folk-art paintings, known as minhwa, tigers and magpies often feature together. The magpie is seen as a bearer of good news or luck, and the tiger is often portrayed as a grinning creature, not the fearsome beast one might expect. His grin and easygoing appearance in folk-art can be misleading, as the powerful tiger is considered a defense against the supernatural, especially the ghosts of people. In minhwa, the magpie tends to sit in a pine tree (often a symbol of the new year) and tease the tiger from over its head. The combination of symbols is thought to bring good luck, and paintings with the motif were often hung outside the gates of homes for the new year in the hopes that both good fortune and protection from evil would be forthcoming for the year. Some examples of tiger-and-magpie minhwa can be seen here. Sean (Charlie) works quickly and efficiently. The outlining was done in less than two hours and came out as good as the drawing. The final product, at least until the next session when color and shading will be added, is below. Go Daisy! The tattoo looks beautiful so far. It’s beautiful. I’ve thought a couple of times of getting a wren tattoo, but there’s that whole pain thing. Really beautiful. I have one tattoo and, uh, it really hurt. I love it but I won’t be getting another . 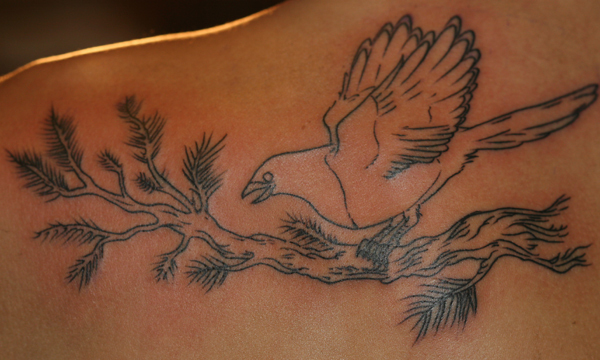 . . no matter how much I want a bird tattoo! What a neat juxtaposition though . . . I just finished reading about magpies in decline on Birdchaser and now I’m reading about Daisy honoring them this way. Nice. I appreciate the effort and the artristry but not the pain factor. I’ll be interested to see the finished tattoo. That is absolutely beautiful. And makes me want more. I always thought the pain was way over-rated. That is a beautiful tattoo. 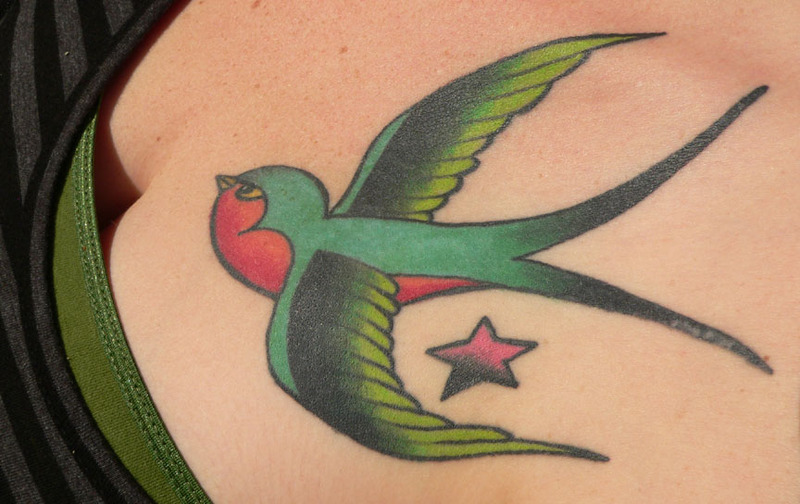 One of my step-daughters has a raven on her arm, and the other has a large barn swallow (I think) on her chest. Here’s a pic of it. I’m not brave enough for such things, but I do think they are lovely. That’s an excellent tattoo. Among other things, I like the life in it; the bird so active. I also like the depth to it, the symbolic significance. Fascinating — thanks Corey and Daisy. Reason To Become a Bird Watcher #3: No Regrets!